ABC Summer 2016 "Must Read"
"Reading a Terry McMillan book feels like catching up with an old friend... Displaying a range of emotions, I Almost Forgot About You is a book that is important for readers of every age. Before reading this novel, the “you” in the title may be up for discussion, but in the end, it’s clear McMillan wants readers to look within to find the answers they needed all along." "McMillan is a gifted storyteller… The cast of characters enriches the narrative, bringing nuance and clarity to scenes and moving the plot along…. Georgia’s story reminds readers who have clocked a lot of living that it’s never too late to reconnect and reflect on the past as they craft the future they want." 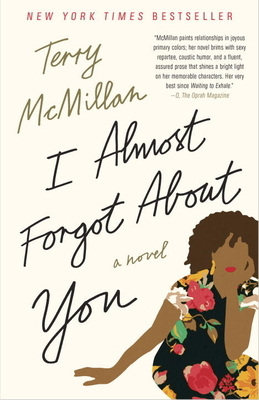 "The ripple effects from Terry McMillan’s breakthrough in contemporary African-American fiction still influence our daily lives... [I Almost Forgot About You is] much in the same vein of McMillan’s other novels that track Black women’s journeys through self-discovery." "McMillan is a master at her craft. Without a doubt, this book will be a hit with anyone who feels stuck in life and is ready to make a move. McMillan has done it again. Get this book and read about Georgia’s journey. This is another book that should be on everyone’s reading list." "The reader finds herself torn between gritting her teeth at how right McMillan gets the relationships between best friends, ex-spouses, ex-lovers, parents and children and putting the book down to laugh out loud. Run, don't walk and pick up this exuberant summer read."